On January 20, 2009, the eyes of the nation and the world were focused on the inauguration of President Barack Obama—called by some historians the most significant inauguration of a president since George Washington. And for every American lucky enough to be present at the celebration, thousands were watching this emotional series of events (swearing-in, parades, galas) and wishing they could be in Washington, D.C., in person. In this Official 2009 Barack Obama Inaugural Book, Epicenter Media, led by the company's president, Matthew Naythons, will document President Obama's Inauguration, celebrating the events through photographs and personal stories, in a manner reflecting the Obama campaign itself. Through a coordinated outreach to celebrants from around the globe—from high school students snapping photos with their camera phones, to amateur shutterbugs toting their digital cameras to the festivities on the Washington mall—the Official 2009 Inaugural Book Project brings together the perspectives of tens of thousands of participants and observers of this inauguration. The best photographs are showcased in a beautiful commemorative Official Inaugural Book, produced by Epicenter Communications. And for the first time, individual amateur photographers across the world were able to participate directly by sending in their photographs to the project's Official Inaugural Photo Gallery—hosted by Photobucket—and create their own customizable print-on-demand inaugural album using Kodak's print-on-demand technology. In addition to user-submitted images, the commemorative work includes photos from an elite team of award-winning photojournalists. 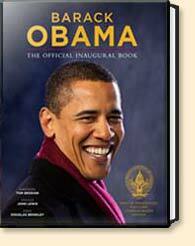 The book will be available in April, on the 100-day anniversary of President Obama's Inaugural. Epicenter Media (a division of Epicenter Communications, Inc.) is led by Matthew Naythons, and produced the Official 2009 Barack Obama Inaugural book. The company first produced an Official Inaugural book in 1993: An American Reunion, the Official Presidential Inaugural book for President Clinton. In 1997, Epicenter produced the official book for President Clinton's second Inauguration, and was subsequently invited by the Bush Presidential Inaugural Committees to produce Official Inaugural Books for President Bush's first and second Inaugurations in 2001 and 2005. In addition to the four official inaugural books Epicenter has produced, its extensive list of other high-profile photojournalistic books demonstrates the company's track record in bringing together the worldwide journalistic community in large-scale endeavors. A photojournalistic chronicle of the war in Bosnia focusing on the city of Sarajevo, produced and published during the siege. Epicenter brought together dozens of photographers and writers for a common goal—to bear witness to the destruction of Sarajevo in the hopes of focusing world attention on the conflict. Epicenter orchestrated an edit of the work of virtually every photojournalist working in Sarajevo. Essayists included Christopher Hitchens, Pulitzer-Prize winner John F. Burns, and David Rieff (epilogue). A behind-the-scenes chronicle of the 1992 Clinton presidential campaign, based on the black-and-white photographs of TIME magazine photojournalist P.F. Bentley. This best-selling book featured essays by Roger Rosenblatt and Michael Kramer. On October 7, 2002, 120 of America's greatest civilian and military photographers launched an unprecedented global mission—to produce, over the period of one single day and across the world's 24 time zones, a portrait of the men and women of all four branches of the American armed forces. In addition to the 120 assigned photographers, the Epicenter team also worked closely with the Pentagon to allow hundreds of military photographers ("milphogs") to contribute their photos to the project through a dedicated website, in a global 24-hour effort that ranged from training bases at home to night missions in Afghanistan. A photographic exploration of the medical progress and individual valor inspired by the physician in the battlefield. With text by Dr. Sherwin Nuland, a prologue by William Styron and photographs from more than one hundred international archives. A celebration and examination of women's daily lives, photographed on April 8, 2005 by 50 leading women photographers, and edited by a team of female photo editors from top magazines. Includes 12 essays by Sisters co-author Carol Saline, and 50 additional short profiles of individual subjects. Excerpted in People, and featured on Good Morning America.